"For this slot tournament we picked three Games of Fortune to inspire our players," said Intertops Poker's casino manager. "They all have unique bonus features and they all dazzle us with the riches we hope to win!" The top ten point scorers in the week-long slot tournament, will be awarded their share of $1000 in prize money. Make it to number one and win the $300 grand prize! Intertops Poker and Juicy Stakes Casino host the busiest online poker rooms on the Horizon Poker Network. 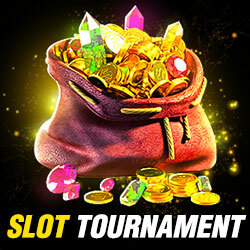 They also have hundreds of unique online slots and table games from Betsoft, Lucktap and Worldmatch. Treasure chests, gold bars, jewels and priceless coins are hidden deep inside a buried cavern in Treasure Room. The Sword and Shield instant bonus can award up to 550 credits. New last month, Reels of Wealth is built on Betsoft's "Rolling Wins" platform which gives a re-spin with up to 3X prize multiplier after every winning spin. In its bonus game, with reels surrounded with gold and jewels, you collect special Jackpot symbols to win one of four incredible jackpots. As the special jackpot symbols fall into place they explode, allowing other symbols to cascade onto the reels. In the majestic Royal Reels, three consecutive gemstones start a pick game with instant prizes and scatters trigger free spins.